After Mom's Special as a tribute to my mom, I thought of doing another special event this month. Diwali falls on November 2nd and during the month of October, I will be busy making some sweets and snacks. As a blogger I know you will also be busy with preparations and main thing is that all your beautiful blogs will be full of Diwali special recipes. 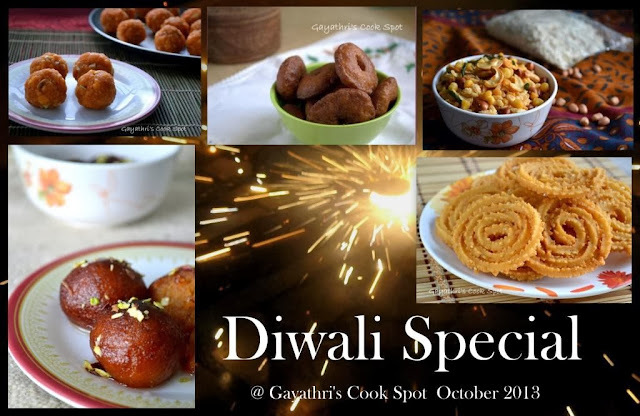 So to make an interesting read for the readers, I invite all the bloggers to link your Diwali special recipes to the event which will be going on for this whole month. And again there is a giveaway too. 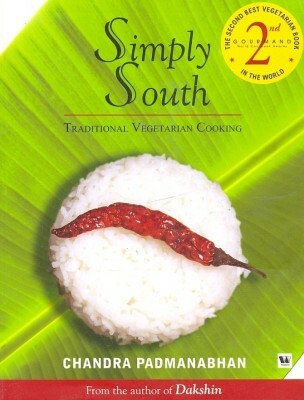 It is Simply South - Traditional Vegetarian Cooking by Chandra Padmanabhan. A lucky winner will be selected on November 2nd and will be gifted with this book as Diwali gift from Gayathri's Cook Spot. 1. Only vegetarian dishes allowed. Eggs not allowed. 2. Please stick to the idea of Diwali recipes. Any recipe which doesn't fit into this criteria will be removed. 3. While posting it in your blog, give a short note on how you celebrate Diwali. 4. If linking an archived post update it with this event announcement and a short write up about Diwali. 5. Only 2 archived entries allowed. 6. No limitations for new entries. 7. The linky tool will be up until October 31st. 8. All the linked post must have a link to this announcement page to spread the word. And coming to the winner of last month's Mom's Special event, I received 36 entries and I selected an entry through random number generator. It is link number 21, Kozhukattai from Sasi's Kitchen. Congrats Sasi. Please mail me your Indian address and phone number so that I can ship you the book.